Once upon a time there was a poor shoemaker. History doesn't tell us whether it was the maker of the shoes that was poor or if it was the shoes themselves. Whatever it was, it is likely that one went hand in glove with the other. If he produced poor shoes, word would soon get round and people would stop buying his produce. A couple of bad reviews on Trip Advisor and his business would soon hit the skids. Any road up, he barely had enough leather left in his workshop to make one pair of shoes [He was down to his uppers. Ha! - Ed.]. If he didn't make a sale within a couple of days, he would have to pack up his business; McDonald's were looking to start up in the town and their offer was quite tempting. Luckily, somebody who didn't much like the idea of a burger giant starting a business in their midst was a couple of vegan elves who, ironically, were a dab hand at making shoes. That night, while the old cobbler was asleep, the elves stole into his workshop and set to making the small pieces of leather into a beautiful pair of child's shoes. When the old shoemaker went into his workshop the following morning, he found the dainty shoes. Now, if you or I had been him, we would probably have tried our darnedest to trace the individuals who had fashioned these fine shoes. Not our old shoemaker. Oh no. What did he do? He placed them in his workshop window with a for sale sign. Sure enough, some rich person looked in the window, liked the shoes and bought them. This gave the shoemaker enough money to buy a load of new leather to make into shoes. But did he make them into shoes? No he did not. He quite liked the idea of getting someone else doing the work for him while he reaped the rewards so he left the material in his workshop in the hope that whoever had made the first pair of shoes would return and make some more. That night, the elves returned and saw all this leather and immediately thought, 'Stone me! He's expecting a bit much here'. Nevertheless, they rolled their little elf sleeves up and worked through the night, by the end of which there was a dozen or more pairs of shoes finished. When the shoemaker entered his workshop, he saw all these shoes and thought, 'Woo hoo, this is a cracking way to get rich'. Once again he put the shoes in the workshop window and before long all the pairs were sold and word was beginning to spread about the fine quality shoes that he was selling. Many people came to buy shoes but were disappointed to find that there were none left. But the clever entrepreneurial shoemaker took lots of orders and deposits from these customers. He then went out and bought a whole barrow load of leather. However, instead of simply leaving the leather out to see what would happen through the night, he wrote instructions for all the shoes he required and then he hid so that he could watch what was happening. Sure enough, the two elves returned and saw the mass of leather and their instructions. After taking a sharp intake of breath, the elves set to and worked as fast as they could to get the shoes made. They worked right through the night until almost day break but, at last, they finished them all and wearily slipped out of the shop. Now, the shoemaker began to feel a bit guilty about the elves doing all this work [I should flipping well hope so. - Ed.] and thought he should do something to repay them. He had noticed that the clothes they were wearing were little more than rags. The next day, after flogging all the shoes and taking in a lot of cash, the shoemaker decided to repay the elves by making them some new outfits. So, that night, he left out the new clothes and went to bed happy in the knowledge that the elves would be satisfied with the new outfits. With that, they searched the workshop for anything of value. They found the bag of cash which the shoemaker had left in the workshop. Now, it was the elves' turn to shout woo hoo. They snatched the bag of money and, just before making good their escape, they torched the place for good measure. The moral of this story? Don't mess with elves. Okay? Actually, I am beginning to think that these two were just masquerading as vegans but were really in the employ of McDonald's. The big footy story is not that Celtic beat Belfast side Linfield in their second round Champions League qualifier. No, the big story is that Leigh Griffiths had a bottle thrown at him and was booked because he picked it up. Strange reason for a yellow card don’t you think? Apparently there had been various ‘missiles’ thrown onto the pitch throughout the game - Celtic are not the most popular side in Northern Ireland. Nobody had stopped to pick them up, so why did Griffiths lift this particular object? Well, it was a Buckfast bottle. Buckfast is a tonic wine popular in ‘ned’ culture. It has high alcohol and caffeine levels and, if ever you see a group of tracksuited teens drinking on the street, it seems to be the drink of choice. It is the sort of beverage that is never actually drunk in any other environment, such as a public house. Nobody ever orders a bottle to accompany their meal in a restaurant. The only food which might be associated with it is a takeaway kebab. It is a cheap way to reach a state of inebriation, basically. What suggestion am I making? Leigh Griffiths? Buckfast? Make your own mind up. 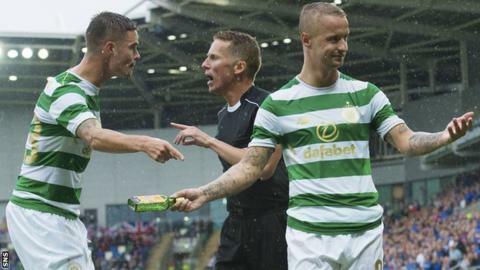 Leigh Griffiths asks the crowd whether he should smack the ref over the head with the Bucky bottle after being carded. Were any famous or notorious people born on the 15th of July? Of course. Here are some I’ve even heard of. Inigo Jones 1573 (Builder. ), Rembrandt 1606 (Self-obsessed painter. He produced nearly one hundred self-portraits. [Who of? - Ed. ]), John Fowler 1817 (Who? He was the engineer who built one of Scotland’s most recognised landmarks - the Forth Bridge. ), Emmeline Pankhurst 1858 (The original Millie Tant. A Viz reference there. ), Hammond Innes 1913 (Organ-playing compost maker. [Getting silly. - Ed. ]), Iris Murdoch 1919 (Rupert’s mum [This is getting sillier. - Ed. ]), Leopoldo Galtieri 1926 (Don’t mention the Falklands. ), Clive Cussler 1931 (Writer who fought at the Little Big Horn [Too silly. - Ed. ]), Harrison Birtwistle 1934 (Composer of serious music. Do you want a clip? Yes? Tough. ), Robert Winston 1940 (Ray’s dad. [As I said. Silly. - Ed. ]), Millie Jackson 1944 (Chanter. Here’s a wee clip from way back when 'afro' hairstyles were all the rage. Incidentally, why am I reminded of Carly Simon when I see Miss Jackson? ), Jan-Michael Vincent 1944 (The soldier who declared peace. ), Linda Ronstadt 1946 (Another chanter. Another clip? Here is her only UK hit, a duet with Aaron Neville called Don't Know Much. ), Twinkle 1948 (Yet another chanter. Very nearly a one-hit wonder - a follow-up reached number 21 - with this song that reached Number 4. After listening to that, I’m surprised it didn't go higher. I reckon that is definitely number 2 quality. ), Trevor Horn 1949 (A Buggle, record producer and one-time vocalist with Yes. Shall we have his biggest hit? Why not. All together now... I heard you on the wireless back in 52. ), Celia Imrie 1952 (Miss Babs. ), Mario Kempes 1954 (Footy bloke), Ian Curtis 1956 (Troubled singer with Joy Division. Here’s a clip for you to enjoy. ), Joe Satriani 1956 (Geetarist. Here’s a virtuoso performance. [You mean show-off performance. - Ed.] Nice hat, Joe. ), Forest Whittaker 1961 (The last king of Scotland. ), David Milliband 1965 (Nope. You’ve got me there. I’ve heard of Glenn and Steve, but not the David Miller Band. [That is a very old joke. Shame on you. - Ed.]) and Jason Bonham 1966 (The rock and roll world’s favourite ‘go-to’ drummer.). I wouldn’t bother holding your collective breath. Teaser time. Yay! Last week I asked you which English Premiershit club amassed the fewest points while avoiding relegation. The answer was West Bromwich Albion in the 2004-05 season when they took only 34 points, but finished in 17th spot. One for this week? Here’s a question about a film. Different. The 2006 film Offside was about a young girl’s efforts to get into the crowd and watch a World Cup qualifier in which country? That’s it. And finally, Cyril? And finally Esther, I am indebted to a Miss C. Imrie who appears in these clips of some her most amusing moments (it says here) from the Victoria Wood series As Seen On TV... although don’t ask me why the first snippet is of Patricia Routledge.